Getting to know your database may not sound like a fun time. . .but if you and your database become more closely acquainted, you’ll find that it’s an important ally in improving the effectiveness of your marketing automation campaigns. Why? If you really understand your database, and continually work to keep it in good shape, your campaigns will be populated with better qualified leads. Getting better qualified leads into the campaigns in the first place means you are not wasting all that marketing magic on poor quality or unqualified leads—and ultimately that results in a higher ratio of leads that become sales. 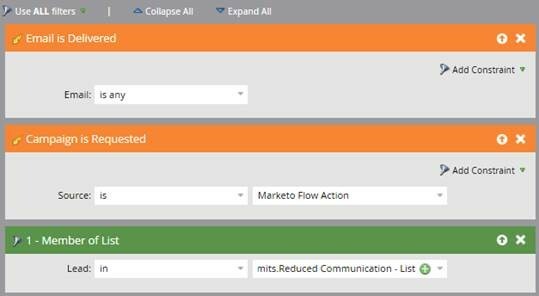 In my role as a DemandGen Campaign Specialist, I often pull lists for clients. Sometimes it’s clear that the segmentation could be improved, and more often than not the reason for that is a lack of understanding of what the database can do. Here’s what I mean. Let’s say a client wants to do a campaign to distributors serving Las Vegas. Often, I’ll get asked to do all leads in California, Arizona, Nevada, Colorado, and Utah! Not only is it much too broad, but also, if the database is not complete or standardized, it may not encompass important leads that might be in those regions. Standardizing data is critical, such as by using dropdown lists for state and country. You can’t use data that doesn’t show up because it’s spelled a different way. If you have them, use zip codes or telephone area codes instead of state to improve geographic targeting. Run a data cleansing program to update records. Text input fields often make segmentation difficult. For example, if your job title field is not standardized, and you are targeting CIOs, run a report to see what percentages of different titles you have been getting. Out of 100,000 people, perhaps you see that 30% of those leads are CIO, 25% are Chief Information Officer, etc. Pick the top 10-15 titles and use those as criteria for your segment. Implement some general usage form fields. Trust me, you will use them! Clients frequently ask me to add fields to forms to ask specific questions like “are you attending all days or just one day.” But if there are no fields available, I have to reuse this form field from last year that was “do you have food allergies” and keep track of it somewhere; it can get confusing really quickly. So have some general usage fields that aren’t tied to any one campaign, and are available to use whenever we have these random questions. Provide options for the “complainers.” Every company has the “complainers,” leads that have indicated dissatisfaction with the amount of emails they have received, but have not yet unsubscribed. Even with communication limits set at the system level, for these leads that may not be enough and they may need additional suppression. So another option is to create an ongoing program that will monitor the frequency of emails to certain leads, and block those leads from receiving emails within a given time frame. One way to achieve this outcome is shown in these screenshots (in Marketo). 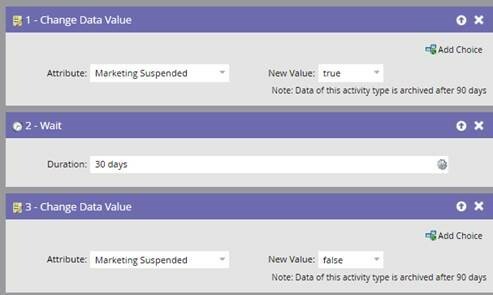 With this method, as leads are added to a list, they will be sent to a campaign that will set them to “Marketing Suspended = True, wait 30 days” (or any desired amount of time), after which Marketing Suspended will be set back to “False” allowing the leads to qualify for emails once again. 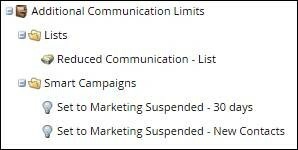 Additionally once a lead that is a member of the list is sent an email, they are once again pushed into the flow to be set to Marketing Suspended for another 30 day period. The bottom line is this: everyone’s database is going to be different, so not all solutions will work the same way for you that they have worked for someone else. The goal is to really understand the systems and tools available to you, and how to put them to work. And more importantly, to really understand your database. Ask yourself: what defines the leads? What data is available? What data is collected? Is there standardization? Once you know this, you’ll find yourself formulating logic and thinking about criteria needed simply while having a discussion about strategy. Seeing the data road blocks well before your new campaigns have started to begin development could save you a lot of time and energy. Adam Mokrzecki is a DemandGen Campaign Specialist who supports the marketing efforts for multiple client accounts. A Jack-of-all-trades, Adam is Eloqua Partner Certified and a Marketo expert with extensive experience in campaign strategy and execution, lead management, reporting and analytics, email and landing page development. Adam has a keen sense for problem solving, quickly finding and implementing solutions to any challenges keeping clients from reaching their marketing goals.